Background and objectives Marked changes occurred in the vascular access profile of patients receiving hemodialysis in the United States over the 15-year period of 2001–2015. This study was undertaken to evaluate how these changes have affected dialysis access maintenance and salvage procedures performed in freestanding dialysis access centers and to examine the effectiveness, efficiency, and safety of these procedures in this setting. Design, setting, participants, & measurements Data were collected from freestanding, dedicated dialysis access centers operating under a common system of management. Data were available on 689,676 dialysis access procedures. Data relating to case mix, procedure outcome, procedural time, and intraprocedural and immediate postprocedural complications were analyzed. Results The arteriovenous procedure profile changed from one characterized by approximately equal numbers of angioplasties and thrombectomies performed on arteriovenous grafts (AVGs) to one characterized primarily by angioplasties performed on arteriovenous fistulas. The percentage of angioplasties performed throughout the study was significantly greater than thrombectomies, with a mean of 67.9% versus 32.1% (P<0.001). Interventional procedures did not decrease with increasing arteriovenous fistula utilization in prevalent patients receiving dialysis. The incidence roughly paralleled the increasing prevalence of this type of access. A decreasing percentage of AVG utilization resulted in a progressive, roughly parallel, but disproportionately higher, decrease in the percentage of AVG procedures (P<0.001). A progressive improvement in procedure outcomes and a decrease in complication rates and procedure times were observed (P<0.001 for each). A progressive decrease in tunneled dialysis catheter placement was also observed. Conclusions The procedure profile treated in freestanding, dedicated dialysis access centers changed significantly over 15 years, reflecting the changes that have occurred in the vascular access profile of the dialysis population. Significant changes have occurred in dialysis vascular access in the United States in the past 15 years. In 2001, the predominant dialysis access was a synthetic graft, with 35% used in incident patients and 41% in prevalent patients. This contrasted with 29% and 33%, respectively, for arteriovenous fistulas (AVFs) (1,2). The first iteration of National Kidney Foundation–Kidney Disease Outcomes Quality Initiative (NKF-KDOQI) Clinical Practice Guidelines for Vascular Access was published in 1997 (3). However, despite the recommendations that were made, it was followed by only a minimal increase in AVF use. Vascular access accounted for 16.8% of hospitalizations of patients receiving dialysis in the late 1990s (4). Although the percentage had decreased over the previous 5 years by approximately 20%, in 2001 approximately 50% of vascular access procedures were still being performed in the in-patient setting (1,5). The Fistula First Breakthrough Initiative (6) which started in 2003 resulted in major changes. By December 2014, 63.4% of all prevalent patients receiving dialysis were using an AVF (7). The use of synthetic grafts had gone down proportionately to 18.3% in 2014. Unfortunately, 61.6% of incident patients had a catheter as their only access and another 20% were using a catheter while waiting for an arteriovenous access to mature. For prevalent patients, these numbers were 9.4% and 8.9%, respectively (7). There has been considerable growth in the frequency with which dialysis access maintenance and salvage procedures are being performed. More than two-thirds of these procedures are being performed in the outpatient setting, a large portion of which are freestanding dialysis access centers (5). Additionally, interventional nephrologists are performing a substantial number of these procedures, primarily in freestanding, dedicated centers. The purpose of this study is to examine changes that have occurred in dialysis vascular access maintenance procedures performed in freestanding centers dedicated to that purpose and being primarily performed by interventional nephrologists. Secondary goals are to examine the effectiveness, efficiency, and safety of these procedures and to examine the differences between procedures performed on AVFs and arteriovenous grafts (AVGs) in a large series of cases. The cases that form the basis of this analysis were derived from a group of managed, freestanding dialysis access centers. Electronic medical records served as the source of the data retrieval. Monthly verification and validation of electronic record data were performed for quality assurance. Centers providing data for this study were in all regions of the United States except for the Northwest. Patient demographic data were collected for each individual center on an ongoing basis over the entire study. In addition, code frequencies for each of the major procedures performed were collected monthly for each individual center. The comparison of these data did not reveal any significant differences between different regions of the United States represented in the centers that were operational during this period. The study was Health Insurance Portability and Accountability Act compliant. Institutional Review Board approval was obtained; individual patient informed consent was waived because the study only consisted of review of data from the electronic medical record without patient identifiers. The exact techniques which were used in this study varied somewhat, but basically followed those that have been previously described (8). NKF-K/DOQI Clinical Practice Guidelines were used for treatment indications and definitions of procedural success (9). Except for tunneled dialysis catheter (TDC) removal procedures, the patients received moderate level sedation/analgesia which was managed according to protocols which have been previously reported (10). All TDCs were placed using both ultrasound and fluoroscopic guidance. Procedure-related complications were classified (Tables 1 and 2) according to the Society of Interventional Radiology (SIR) guidelines (11) and venous rupture was classified as has been previously reported (12). AVF and AVG procedures, i.e., percutaneous transluminal angioplasty (PTA) and thrombectomy (Throm), were considered separately. TDC procedures were divided into three groups—placement group (TDC-P), exchange group (TDC-X), and removal group (TDC-R). The TDC-X group was subdivided into two types: (1) those in which the new catheter was placed at the same venotomy site as the removal (TDC-X1), and (2) those in which the new catheter was placed at a different site after old catheter removal (TDC-X2). The data for the two components of TDC-X2 cases were incorporated with either TDC-P or TDC-R as appropriate, because there was nothing unique about these two procedures. All TDC-X1 cases were checked for the presence of a fibrin sheath, which was ablated before the placement of the new catheter. The incidence rates for procedures were reported as a percentage of the total within a category as well as the absolute numbers. In order to make comparisons on the basis of comparable data, the percentage of dialysis access types in prevalent patients receiving dialysis using an arteriovenous access was obtained from 2001 to 2014 data presented in the annual reports of the United States Renal Data System (USRDS) (1,7) and in other published reviews (2). Procedure time was defined as the time interval from injection of lidocaine in preparation for cannulation through to the removal of all devices from the site. It did not include the time required for hemostasis. Data used in this study were tested to confirm that they represented a normal distribution using the D’Agostinio–Pearson test. Summary statistics were calculated from grouped means for each metric studied to obtain an arithmetic mean, 95% confidence interval, SD, median, and range for each metric. The statistical significance of changes occurring over the duration of the study was tested using the paired t test. The Mann–Whitney rank sum test was used to compare the means between two different metrics. All P values were two-sided and were considered to indicate a significant difference if <0.05. Patient demographics (Table 1) did not differ significantly from national data (1,7). All patients were assessed before a procedure and assigned an American Society of Anesthesiology (ASA) physical status classification system class (13). On the basis of the numbers of patients classified as ASA Physical Status class IV and V, the overall health status of the patients being treated improved progressively throughout the study period. The procedures performed over the study period involved a large number of physicians. The medical specialty profile of these operators changed over the years of the study. However, on the basis of encounters relating to a cohort of 27,613 consecutive patients treated between 2006 and 2009, the profile was nephrology 70.4%, radiology 16.3%, surgery 9.4%, and other 4% (14). A total of 689,676 were performed during the 2001–2015 period. Of these, 477,679 were arteriovenous procedures (69.3%). The arteriovenous case mix shifted from primarily AVGs (83.2% of group) in 2001 to primarily AVFs (63.3% of group) in 2015 (Figure 1). Changes in percentages of dialysis access procedures (percentages are on the basis of total dialysis access numbers). AVF, arteriovenous fistula; AVG, arteriovenous graft. Of the 477,679 arteriovenous access procedures, 265,186 (55.5%) of these were performed on AVFs (Table 3). When these procedures were compared with the prevalence of AVFs in prevalent patients dialyzing with an arteriovenous access on the basis of USRDS data (Figure 2), the changes in both increased in a parallel fashion. Except for the first few years, they differed by only a few percentage points. A total of 212,493 (44.5%) AVG procedures were performed. The percentage for these procedures decreased progressively and, although significantly greater, was roughly parallel to changes in AVG prevalence in the dialysis population (Figure 3). Changes in percentages of arteriovenous fistula (AVF) procedures in relationship to percentage change in AVF utilization in the prevalent dialysis patient population (AVF numbers on the basis of total arteriovenous access procedures). USRDS, United States Renal Data System. Changes in percentages of arteriovenous graft (AVG) procedures in relationship to percentage change in AVG utilization in the prevalent dialysis patient population (AVG numbers on the basis of total arteriovenous access procedures). USRDS, United States Renal Data System. On the basis of total arteriovenous procedures, the percentage of angioplasties (67.9%) performed throughout the study was significantly greater than thrombectomies (32.1%) (P<0.001) (Table 1). Most thrombectomies for all years of the study were performed on AVGs (P<0.001). 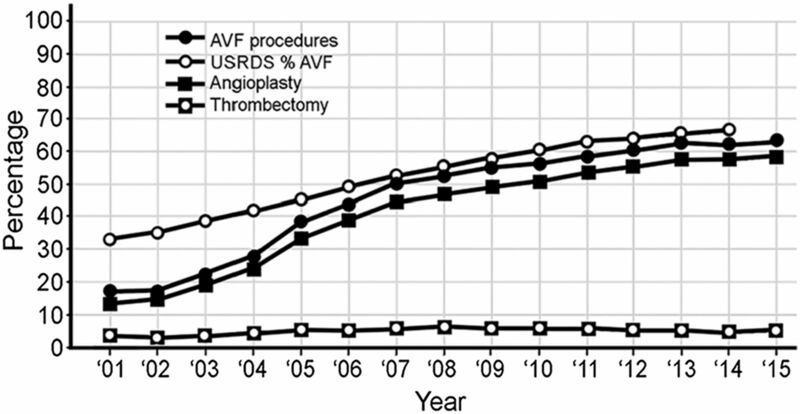 In the beginning, the percentage of thrombectomies performed on AVGs was greater than that for angioplasties; however, the converse was true after 2005 (Figure 3). Overall, the percentages of both AVG thrombectomy and angioplasty decreased progressively (P<0.001 for both) (Table 3). There was no significant difference in the percentage decrease of thrombectomies and angioplasties (P=0.86). The most marked change in percentage for any procedure was the increase in AVF angioplasties (P<0.001). Overall, this represented >50% of all angioplasties performed (Table 3). A mean of 12.6% of these (of AVF procedures) were related to failure to mature (FTM) of newly placed AVFs. The percentage of AVF thrombectomies remained low throughout the entire study, ranging from 2.6% to 5.8% of total arteriovenous procedures and from 7.5% to 20.9% (mean of 11) of AVF procedures. This rate decreased significantly over the course of the study (P<0.001). Whether the access was an AVF or an AVG, a thrombectomy required more time, had a lower success rate, and was associated with more complications than angioplasty (P<0.001 for both AVF and AVG for all three metrics) (Table 3). Complications were seen more often with an AVF than an AVG (P<0.001). The most common complication observed was venous rupture, which accounted for 77.7% of the total AVF angioplasty complications, 74.2% of those occurring with AVF thrombectomy, and 63.5% and 58.1% in AVGs, respectively. More than 75% of these were grade I extravasations. The difference between the incidence of venous rupture in AVFs and AVGs was not statistically significant (P=0.81). Second in frequency was arterial embolization, which was seen primarily in association with a thrombectomy. This accounted for 2.9% of thrombectomy complications in AVFs and 9.1% in AVGs (P<0.001). Endovascular stents were first used in 2005. From 2005 until 2015, a total of 16,514 stents were placed. The indications of an elastic lesion, a recurrent lesion (<3 months), and vascular rupture not amenable to conservative therapy accounted for >98% of stent utilization. Of these, 43.2% were bare metal stents and 56.8% were covered stents. Over the course of the study, bare metal stent utilization fell from 97.1% to 36.3%, whereas covered stents rose from 2.9% to 63.7%. Total utilization increased from 0.6% of total arteriovenous cases to 6.4% (P<0.001). This increase in utilization was apparent for both angioplasty and thrombectomy cases in both AVFs and AVGs. Stents were used more frequently for thrombectomy cases than for angioplasty in both AVFs and AVGs (P<0.001 for both). There was no significant difference in stent utilization between AVFs and AVGs for either angioplasties or thrombectomies (P=0.08 and P=0.15, respectively). Stents were placed for vascular rupture (grade II and grade III) in 4.6% (752) of the total stented cases. With increasing percentage of AVF procedures came an increased level of complexity as judged by success rates (except for AVF angioplasty), procedure times, and complication rates (P<0.001 for each) (Table 3). TDC procedures accounted for 213,236 (30.9%) of the total procedures. The mean for the 15 years was 32.3% of the total dialysis access interventions. During the study, there was a 20% decrease in total TDC procedures due to a >3-fold decrease in catheter placements (Figure 4). Changes in the percentage of catheter procedures in relationship to percentage of total catheter procedures (total catheter procedure percentage is on the basis of total dialysis access group; catheter procedure percentages are on the basis of only catheter procedures). TDC, tunneled dialysis catheter. Mean success rate for TDC placement was 97.7%, and this did not change significantly over time (P=0.22). The major indications for a TDC exchange were dysfunction with a mean incidence of 67.4%, and infection with a mean of 18%. Dysfunction as an indication rose from 56.7% to 84.5% (P<0.001), whereas infection fell from 26.5% to 7.4% (P<0.01). A fibrin sheath was treated in a mean of 30.6% of TDC exchange cases and increased from 24.3% to 35.8% (P<0.01). The times for both TDC-P and TDC-X1 decreased progressively from 32.4 to 22.4 minutes (P=0.004) and from 22.6 to 13.2 minutes (P<0.001), respectively. Total TDC complications decreased significantly during the study from 1.2% to 0.2% (P<0.01). TDC-P complications decreased from 1.6% to 0.5% (P<0.001). The most common major and minor complication observed was bleeding, representing 1.9% and 34.6% (TDC-P), 1.1% and 0.3% (TDC-X1), and 4.7% and 28.9% (TDC-R) of total TDC complications. Other significant complications accounting for 5%–10% of total complications in a procedure category were hematoma formation, cardiac arrhythmia, hypotension, and a fall in oxygen saturation below 90%. The profile of procedures performed for dialysis access salvage and maintenance in freestanding dialysis access centers changed markedly during the years of 2001 through 2015 (Figure 1). To make comparisons using comparable data, these data were compared with the percentage of dialysis access types in prevalent patients receiving dialysis using an arteriovenous access from 2001 to 2014, according to the USRDS (1,7). Although exact identity cannot be assured, a reasonably close approximation can be assumed in view of the corresponding demographics of the patients, the numbers of patients treated, and the number and distribution of the centers involved. An explanation of the changes observed in intervention frequency can best be understood by placing them in context with changes in access prevalence. The arteriovenous procedure profile from 2001 to 2015 changed from one characterized by approximately equal numbers of angioplasties and thrombectomies performed on AVGs to one characterized primarily by angioplasties performed on AVFs. The yearly increase in AVF procedures was roughly parallel and proportional to the increase in AVF utilization in the prevalent dialysis patient population (Figure 2). Angioplasty was the predominant procedure performed in AVFs, representing >50% of all arteriovenous procedures (Table 3). The percentage of AVF thrombectomies performed was consistently <6%, with a mean of 4.7% of arteriovenous procedures. A mean of 41.1% (88.6% of AVF procedures) were angioplasties (Table 3) with a range of 13.3%–58.6% of arteriovenous procedures. Procedures performed on AVFs with increasing prevalence did not decrease as was anticipated. There are several issues that have grown out of the push to increase AVF utilization that might explain this. A clinically functional AVF (15) has a lower incidence of stenosis, thrombosis, and infection than an AVG. However, if all AVFs that are created are considered, the primary patency of AVFs and AVGs is comparable for the first year after creation because of AVF FTM (16–18). Most FTM cases can be salvaged, but it is procedure-intensive (19–21). In this study, FTM as an indication for angioplasty had a mean incidence of 12.6%. However, this number is deceptive as to its contribution to the overall number of resulting angioplasties. Many FTM-AVFs require more than one procedure to become clinically usable. Frequently, repeat procedures are not recorded as FTM. In addition, multiple studies (22–24) have shown that a salvaged FTM-AVF requires additional interventions to maintain its patency. FTM as an indication for treatment is not listed for these cases. Unfortunately, 70%–80% of patients starting dialysis do so with a catheter (7,25–27). If these patients then have an AVF created, time is required for it to become clinically usable resulting in prolonged catheter usage (18,28). This increases the risk of central vein stenosis. Once it has occurred, these cases often require repetitive intervention. As was expected, a decreasing percentage of AVG utilization resulted in a progressive decrease in the percentage of AVG procedures. This decrease was roughly parallel to the changes in AVG use, but as anticipated was disproportionately higher (Figure 3). AVGs have a higher incidence of procedures performed for maintenance and salvage than AVFs (29). In addition, an AVG is less tolerant of low blood flow and thromboses relatively early. Reports have indicated that the numbers of thrombectomies and angioplasties performed on AVGs are approximately equal (29), as was seen in this series (Figure 3). Procedural success for AVF and AVG angioplasty on the basis of NKF-K/DOQI definitions (9) started at a high level and improved over the 15-year period (Table 3). Although more complications were seen in association with AVF interventions, the total complication rate (major and minor combined) for both AVFs and AVGs was below the recommended 5% threshold for the SIR complication classification system (11). Complications occurred more often in AVFs and were more frequently observed in association with a thrombectomy than an angioplasty. As was the case in this series, angioplasty-induced venous rupture has been the most commonly reported complication associated with both angioplasty and thrombectomy (30). Only a small number of accesses experiencing venous rupture could not be salvaged. The second most common complication, seen primarily in association with thrombectomy, was arterial embolization. It is important to note that these were symptomatic emboli and as such undoubtedly represent under-reporting. Most emboli that occur are small and asymptomatic (31). As a result, they are frequently unrecognized and not reported (32). Emboli were reported three times as often with an AVG versus an AVF thrombectomy. Endovascular stents were first used in this cohort of cases in 2005. During the 11 years in which they were used, their utilization increased ten-fold. In the beginning, virtually all stents were bare metal; however, covered stent utilization increased progressively as did stent placements in general. Stents were used more often in AVFs and utilization was higher in thrombectomy than in angioplasty cases for both AVFs and AVGs. Previous studies have shown that AVF-PTAs require significantly more time and supplies to accomplish, and are more cognitively, physically, and psychologically demanding (8,33).These observations, along with the statistically significant lower success rate for AVF thrombectomy, longer procedure times, and a higher complication rate for all AVF procedures demonstrated in this study, attest to the fact that evolving from predominantly AVG to AVF utilization has introduced an increased level of complexity to the procedures being performed. TDC cases in this cohort of patients decreased over the 15 years of the study by 20%. This change was due primarily to falling numbers of TDC-P. In recent years, most of these procedures have been performed in the hospital setting. According to Centers for Medicare and Medicaid Services claims data for 2015, the site of service for TDC-P was Inpatient Hospital 62.2%, Outpatient Hospital 30.2%, Physician’s Office (freestanding dialysis access center) 5.1%, and Ambulatory Surgical Center 0.5%. Exchanges and removals increased slightly but not enough to offset the decrease in primary TDC placements. Catheter dysfunction was the major indication for TDC exchange, with a mean incidence of 67.4% versus 18% for catheter-related bloodstream infection. This latter indication decreased significantly during the study, resulting in an increase in the ratio between the indications from 2.2 to 11.5. Cases were routinely checked for a fibrin sheath at the time of catheter exchange. This was found to be present in a mean of 30.6% of cases. The most frequent complication observed with TDC cases was bleeding. Most of the bleeding that occurred in this series was related to skin bleeding occurring at the dialysis facility after the administration of heparin, when the patient dialyzed immediately after having a TDC procedure. It is important that all dialysis access procedures be accomplished in a timely manner. Patients are sedated using a short-acting sedative, many patients have missed one or more dialysis treatments and returning the patient to the dialysis facility is a high priority, and operational efficiency of the treatment facility is important in the management of daily caseloads. Analysis of this data demonstrated that procedure times for all categories of access cases decreased progressively. The profile of problems presenting for treatment in freestanding dialysis access centers has been materially affected by changes in the overall vascular access profile of the United States dialysis patient population. With the change from primarily AVGs to AVFs has come increasing numbers of angioplasties and decreasing numbers of thrombectomies. With this, the overall complexity of arteriovenous access maintenance and salvage cases has increased. The catheter procedure profile has been altered by the fact that the majority of these devices are being placed in the hospital setting. Judging by changes in success rates, procedure times, and complication rates, the effectiveness, efficiency, and safety of these procedures has improved over the past 15 years. The data upon which this report is based were derived from Lifeline Vascular Access (a subsidiary of DaVita Healthcare Partners, Inc)–managed centers. The authors are employees of Lifeline Vascular Access.